1. Soak skewers in water and reserve. 2. Toast curry powder and garam masala in dry pan, stirring constantly until it begins to smoke. Reserve. 3. In small bowl, mix yogurt, onions, garlic, lime, curry and garam masala mixture, salt, turmeric and cilantro. 4. 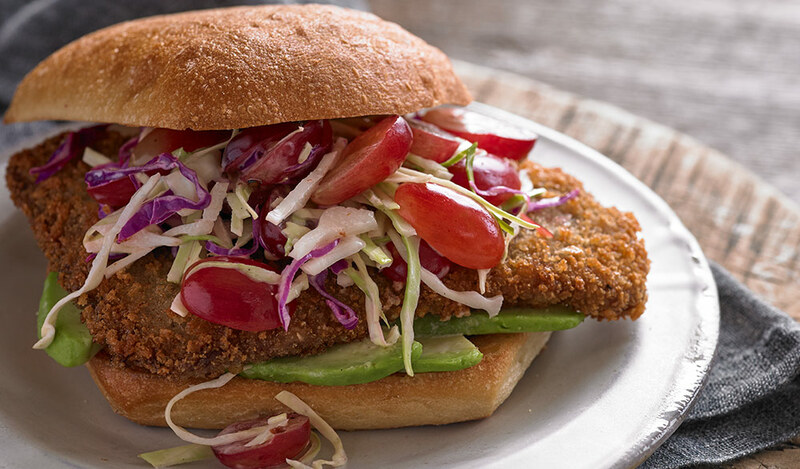 Cut chicken in 3/4″ to 1″ cubes and mix with 3 cups of marinade; chill for 1-2 hours. Reserve remaining marinade. 5. 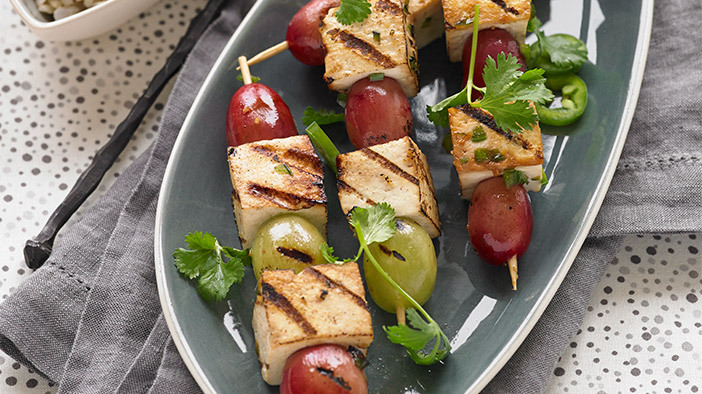 Skewer chicken, alternating each piece with grapes skewered lengthwise. Reserve for cooking. 1. Rinse rice under cool water until water runs clear. 2. Place in sauce pan, cover with water, add salt, bay leaves, clove, cardamom and 1/2 the oil. 3. Bring to a boil for 1 minute, mix and cover with lid. Reduce heat to low, cook for 20 min. 4. Remove lid, fluff and remove bay leaves. Reserve. 2. Place chicken skewers on well-seasoned and oiled grill. Cook on both sides until cooked through. Brush with reserved, fresh marinade, if desired. 3. 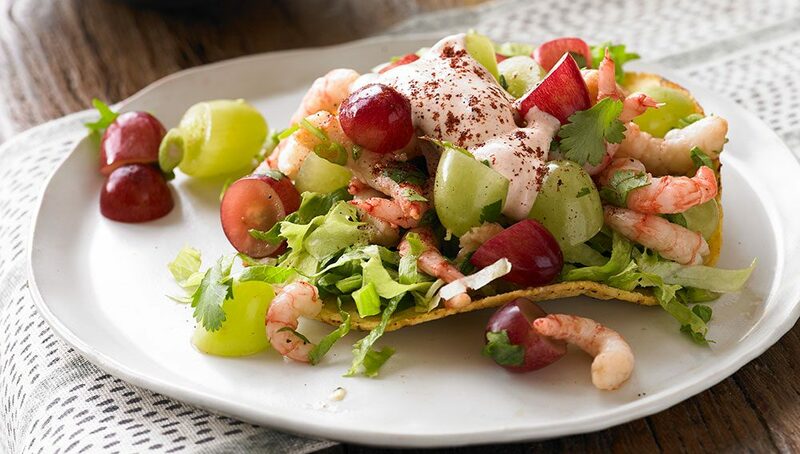 Toss the rice & grapes with a pinch of salt and remaining oil and roast in oven for 5 minutes; gently fold into the rice and place in serving pan. 4. 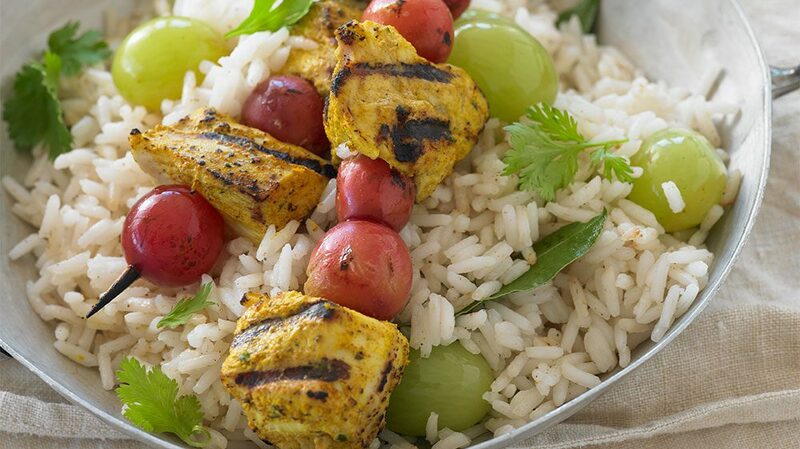 For serving line display: Arrange cooked chicken-grape skewers in pan on top of the Basmati rice. Brush with any remaining fresh marinade, and garnish with cilantro and green onions if desired. 5. For individual plates: Arrange two to three cooked chicken skewers on a plate of the Basmati rice.